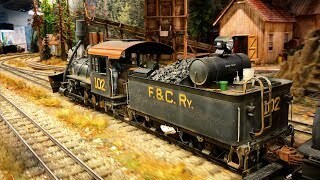 THE SUNDANCE CENTRAL RAILROAD – The Sundance was formed in January 2004 with the goal to create a more detailed and uniformly scened, large-scale traveling layout. This 1:20.3 scale modular model railroad consisting of forty modules for a layout size of 45 feet by 45 feet. The railroad consists of 400 feet of hand laid code 250 aluminum rails that are hand spiked with individual tie plates onto wood ties with a total of 16 turn-outs. The modular was built by a group of seven model train enthusiasts. This diverse group is made up of people who have a passion of early narrow gauge steam locomotives to modern day standard gauge diesels. The purpose for forming this modular group was to provide the public a realistic look at model railroading in a large-scale format. The modules are highly detailed from the scratch built supporting structures and buildings down to the surrounding scenery. The trains and rolling stock that will be running on these modules will also be highly detailed and weathered.